The 6 Station Portable Restrooms Trailer Comfort Series is an ideal unit for mid-size venues and functions. 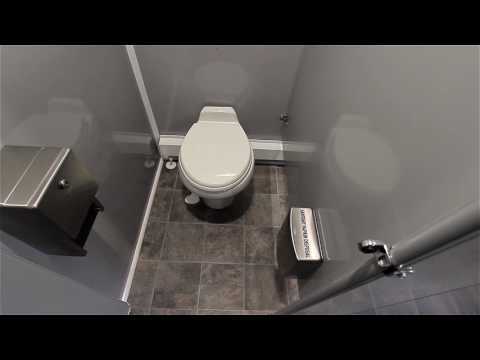 The spacious floor plan includes 1 women’s central suite with 3 stalls and 1 men’s central suite with 1 stall and 2 urinals, each with a separate entrance, offers a beautiful earth tone interior with hard-surface vanities is just the beginning of this designer 6 station portable restrooms trailer! Each suite features stalls with 3/4 height privacy doors, water-saving pedal flush white ceramic china toilets, large lockable solid surface vanities with large shatterproof mirrors, stainless steel sinks with self-closing faucets, soap, and paper towel dispensers, and toilet paper holders. The men’s suite also features 2 hands-free urinals with privacy dividers. Both suites feature easy to clean, one piece, non-skid designer flooring and are fully climate controlled with air conditioning and heat strips.